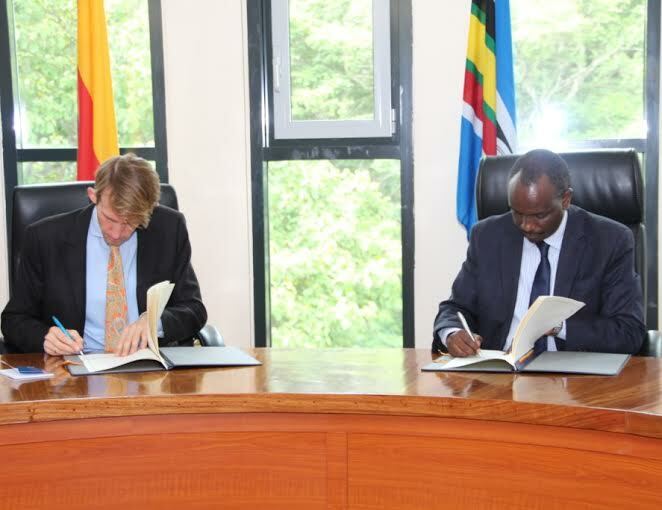 Mr. John Reyels, Chargé d` Affaires of the German Embassy Dar es Salaam, signing the intergovernmental agreement with the EAC’s Secretary General Amb. 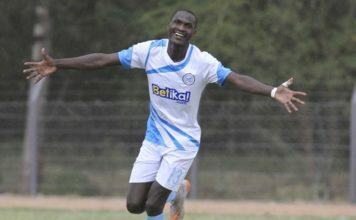 Dr. Richard Sezibera. 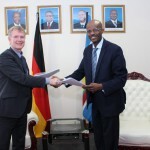 The Federal Republic of Germany has signed an intergovernmental Euro 37 million grant agreement with the East African Community (EAC) to support the economic integration, regional health facilities and water resource management. According to a release by the EAC, the money will cover the period 2016-2018 and highlights a strong commitment by Germany to support the integration process in East Africa. During the signing ceremony, Ambassador Richard Sezibera, the EAC Secretary General, thanked the German government for her continued support to the Integration Agenda especially at a time when integration facing challenges across the world. He said this particular financing agreement comes at the right time when the Community is finalising its New Vision 2050. 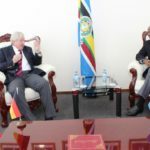 In response Mr John Reyels, Chargé d` Affaires of the German Embassy Dar es Salaam, said his country’s support underlines the importance given to the East African Community. “The EAC is a role model and pace-setter in Africa and we are proud working closely with you in order to contribute to the well-being and prosperity of the citizens of this region,” Mr Reyels said. Under the agreement signed earlier today, Euro 10 million in financial assistance will be invested in the establishment of a regional network of reference laboratories for communicable diseases. The project is in response to an EAC request for support for the prevention and control of epidemic outbreaks in the region. Another Euro 10 million in financial assistance will be used for Integrated Water Resource Management of Lake Victoria aiming at improving water provision and management of water resources. 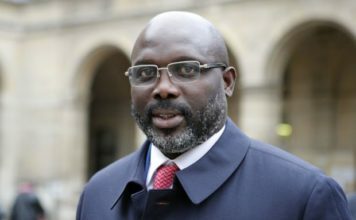 Both projects will be implemented by KfW development bank. The agreement also provides for Euros 17 million in technical assistance to further support the economic integration process, including a contribution to the EAC partnership fund. 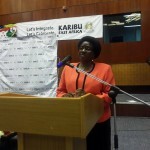 The programme is focusing on institutional strengthening of the EAC Secretariat and on supporting the implementation of the Customs Union, Common Market Protocols and Monetary Union. This includes the elimination of Non-Tariff Barriers such as tax harmonisation as well as Mutual Recognition Agreements for qualifications. At the same time Germany will support the EAC in promoting private investment especially in the pharmaceutical sector, including the establishment of a regional quality infrastructure for the pharmaceutical sector. These projects will be implemented by GIZ and PTB – German Metrology Institute. 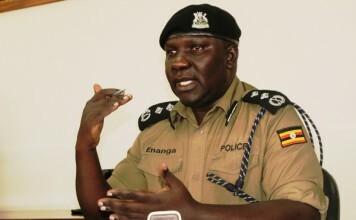 Since cooperation began in 1998 the total volume of German support to the EAC amounts to almost Euro 213 million. Germany also has substantial bilateral cooperation with all five EAC Partner States of Uganda, Kenya, Tanzania, Rwanda and Burundi.